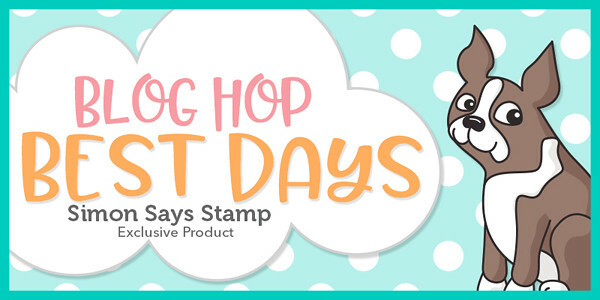 Simon Says Stamp Best Days Release Blog Hop! Welcome to Simon Says Stamp Best Days Release Blog Hop. Today is day #2. I am excited to share with you some my projects using the Best Days release products. If you have come from Lin Brandyberry‘s Blog, then you are on the right track. But if this is your first stop, them do not worry, I will have the full list of blog hop participants towards the end of the post. My first card uses the bird with the sack stamp images from Oh Baby stamp set. I initially wanted to stamp, mask, stamp, mask, sponge the background and colour the images using copic markers. But it was one of those days where things did not go well. I kept making mistakes. And so I stamped the images from Oh Baby stamp set, coloured using copic markers and hand cut them out and adhered on the background ink sponged circle. The background circle is sponged using distress oxide inks in Tattered Rose, Worn Lipstick and Picked Raspberry. I adhered this focal point slightly offset at the bottom left on a white panel sponged with distress oxide inks in Cracked Pistachio and Peacock Feathers. This panel is 3.25″ x 5.50″ in size. I stamped the sentiment on the top right of this panel to balance the elements on this panel. On the right side of the card front, I adhered a strip of rainbow coloured stripped pattern paper and the panel on the right side as shown. Embellished the card with some Simon’s Moonshine sequins and added an enamel heart on the centre of the sack. Here are some closeups of the card. Supplies used to make this card are listed below. I have another card using the same stamp set to share. I have used all the smaller images from the Oh Baby stamp set to make this card. I took an oval die and placed it as a guide and drew around it with pencil. Then I stamped the images from Oh Baby stamp set in clusters around the oval pencil guide using MISTI. Then I filled in the gaps with some sock and bird images. I erased the pencil marks. All the images are stamped using Simon’s Intense Black ink because I am going to copic colour the images. I used pastel colours in rainbow order except for the colour orange. This is very hard for me. I am a bright colour girl and pastel colour always look incomplete for me. I had to apply great restraint not to intensify the colours. Lol! For the focal sentiment I used Oh Baby die. I die cut the shadow using Fog cardstock and the sentiment using pink matt glitter paper. I adhered this sentiment in the middle of the stamped panel using foam adhesives. Because there was a lot of space on top and bottom of the sentiment, I stamped the feet image and the smaller sentiment using black ink and MISTI. I trimmed this panel a little bit and adhered on the white card base using foam adhesive. And embellished the card using sparkling clear sequins and brushed the coloured images using shimmer pen. Now it would not be a blog hop without a giveaway! Simon Says Stamp giving away a $25 coupon to every stop on the hop from your blog comment section. Simon Says Stamp will choose the winner over the weekend and post on our Simon Says Stamp store blog on Wednesday. As promised, here are the list of all the participants of this blog hop. Shop all the Best Days new release products. Make sure you leave a comment to enter a chance to win $25 Simon Says Stamp gift certificate. There was also a blog hop yesterday where more designers shared their inspiration using Best Days products. Make sure you check them out and leave some love. such super sweet cards and those colors! so happy and cheerful! I love both of these cards. The first card I love because of your use of bright colors and Distressed Oxide Inks. However, with the 2nd card I really love how you used the stamps. You made it look like a tossed printed background. I also love the use of color on the 2nd card as well, using the Black really makes the other colors pop. I love your cards today. Really like the ink blending on the circle behind the stork. And your coloring on your Oh Baby card is divine! Your cards are so adorable. This is such a great release. Both cards are so sweet, I especially love the lovely colours on the first one – rainbow colours are always so fab! Those are beautiful. The vibrant colors on the background circle really make the stork pop, and I love the background you created on the second card – so cool! Cute cards. I really like what you did with the stork card. Very sweet cards. The new products in this release just are endless and so is the talent showing it all off! Adorable cards. I love the bright colors on your stork card! WOW – these cards are gorgeous! Love these cards!!!!!!!! This hop was soooooooooo much fun!!!!!!!!!! Love the we’re expecting card….cute collage! Super adorable cards! Each one is different and lovely in its own way! I love your adorable baby cards! Both your cards are cute baby cards. Love the multiple stamp background. Your cards are so cute! Love how you stamped your background on the second card! Super sweet cards! Thanks for the inspiration! Sweet cards, how nice to use all the little extra stamps in one card!! Both your baby cards are sweet. You did a great job in using all the little stamps to create a custom background. TFS! I really like the first one. Great colors! I like how you created the stamped background. Nice cards. Really love your cards today! Great ink blending! Both your cards are adorable, but I really love the ink blending and the rainbow colors on the first one the best! Fantastic new SSS release! So many great products to chose from! Really enjoyed this blog hop with so much talent and inspiration! Thanks for sharing yours! Everyone has baby fever! I am loving the different baby cards. I love how the stork looks in that ombre circle – great way to add bright colour and highlight a focal image. Really like your use of the smaller images to make your background. Darling, sweet baby cards. Beautiful inspiration. Thr 1st one is my favorite! But lovely creations overall! What cute cards. I liked them all, but the first one is my favorite. Very cute cards! Thanks for sharing them! Lovely cards, love the colors. These baby themed items are so precious. I love the colour palettes you’ve used on these cards. I would love to get these baby cards! lol They are fantastic! Very cute baby cards! Great colors used on them. Thanks for sharing! Your card is awesome!! I love the design, I love the colors, I love the striped paper down the side! I have definitely added it to my Pinterest board!! What wonderful baby cards! I love the background behind the stork. Oh wow these cards just pop! So fun! Colours r just magnificent! Thanks for sharing!! What adorable cards. The second card is unique, so I think I like that one the best. Both are very sweet. Your cards are so CUTE!!!!!! Super adorable cards!! Thanks for sharing! Adorable baby cards!! Fabulous color combos on both. Love the vivid rainbow with your stork and the heart on the blanket! The pastel colors with the baby annoucement is so sweet! So cute and fun, sweet baby cards. love the last one-so different. thanks for sharing. Love these creative sweet baby cards! wonderful card designs and colors! Love seeing all of these creations! Beautiful cards and such an inspiration. There are 2 new babies in my circle, need to get busy and order me some dies and stamps and get busy. Thanks!! Your two cards are adorable ! I love your choice of colors, either bright or soft, but perfect ! Two really pretty cards from this release and I love them both “the Best”! Such sweet cards! I love this release! So sweet!! <3 I love them!! Those are such sweet baby cards! Love them both, but the first one with the diagonal stripes on the side and that stork…I love that stork! TFS! I like how you used a rainbow palette for both cards, but made one vibrant and the other soft. Oh my, both these cards are so cute. I just love how the first one turned out. I also like the way you stamped the images on the second card. I love both of your cards — I love how you put the stork in the circle like that and I absolutely ADORE the card with all the little images! Great idea to use them to make your own patterned paper! I just love that card! So sweet. I love the colors and fun stamps. So inspirational and thanks for sharing. 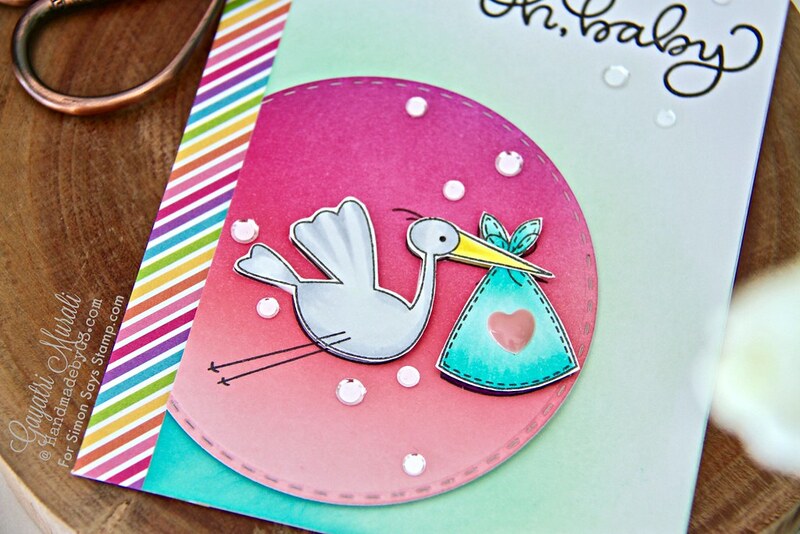 I absolutely love, love, love your stork card! What great color combo! Both cards are amazing! Love both of your cards, but the first is definitely my favorite! Thanks for sharing your creativity! Two great baby cards! You have really illustrated how the same stamp set can be used to create such different cards. Thanks for the inspiration! Really sweet baby cards. Love the colors. Oh those baby footprints, how precious! You made such a neat background! Both these cards are just wonderful! Great release. Beautiful job! Great cards, the first one is my favorite! That stork image is one of my favorites from this release. Just so cute. That stork is just too cute, and I love the color, I also love how you used the stamps to make a background. Thanks for sharing . Both baby cards are beautiful coloring and blending. So colorful and adorable baby cards!! Thank you!!! Love these baby cards Gayatri, they are definitely sweet, I am certain any new Mother with swoon over these. Both cards are super sweet! Love your use of the new releases! Cute!! Love the colours of the distress oxide inks that you used! What a bright and happy card the first one is. The recipient should frame it and put it where the baby can see it! Bright colors, bright mind. Awesome baby cards. Really show cases the products. Your cards are both so sweet! Love the new release from Simon and your use of the baby set is fabulous. Oh my gosh!!! That stork card is adorable!!! Both cards are very cute! Thanks! Wow.. Love Love Love them. Your “oh Baby” card is adorable. Thanks for sharing! Super sweet cards! Especially the first one – luv the colors on that! Love the oh, baby we are excited! The cards are amazing! Your baby cards are lovely. I really liked how you took the stamps from the Oh Baby set and made a background with them. It turned out really cute. That’s a really cute and different card – the one with the diaper pins etc. Your cards are so fun, and creative. I am inspired to make my own background using many smaller images. So creative and the colours are so much fun too. I really love the bright colors on your first card – uncommon for a baby card, which is why I like it so much! Adorable! Love your use of the stamps in a collage. Such an adorable design. Despite your original plan, the final version of your first card is so beautifully colorful and lovely! Th second card is such fun with the willy nilly stamped pattern-love it! Both cards are delightful! Love the background you created on the second card. So cute! Cute cards! I like how you randomly stamped the background for the second card. It’s very sweet and the colors are very soft! Thank you for sharing! Adorable baby cards! Love them, especially the background of the second card! Such a lovely and inspiring idea! Such lovely baby card! They’re so different in style and both show off the new Oh Baby stamps so well! Wonderful cards. I love that first one. It’s bright and cheery with the bold colours . That little strip of rainbow stripped paper is a nice added touch. Love the soft colours of second card too, and all those little images are so cute! The colours on your OH baby are absolutely yummy. Beautiful cards. Your cards are adorable! Love each one of them! Wow fabulous cards, love the stork and the colours are so bright and cheerful. Both these cards are too cute!!! I love both of the cards you have made!! I really love word dies especially when they come with the shadow die. Great cards. Thanks for sharing your pretty cards. The first one turned out so cute even if it wasn’t how you initially envisioned it! What a variety of cards! All are so eye-catching and colorful! Love the use of the oval die to create space for the words. Well for a card that just did not go as planned I for one say you nailed it!!! your second card is super fun and what a cute way to announce that a person is having a baby!! I have a new grandbaby due this summer. Thanks for the inspiration! Always love the happy colors on your cards! Very adorable cards and so beautifully colored!! Darling baby cards! Love the colors! Sweet, beautiful and fun cards! Fantastic inspiration. I really like the coloring on the stork card! I think it’s such fun to use small images to create a fun background and this stamp set is perfect for this. Your colorful cards are just wonderful!! Super cute cards!! really like the stork one the colors are beautiful!!! Love the style and colors. Very sweet cards. Just beautiful cards!! Love the colors! Thanks so much for sharing them!!! the scattered stamp technique is refreshing. Thank you for sharing! Love the stork! Love the bright playful colors (and stripes) with that fun storm and your stamped background on your 2nd baby card. Such cute cards. Love both the bright and the pastels you used. I love both of these cards. I’m in a baby mood because I just found out yesterday that my daughter and her husband, who have been trying for years, are expecting a baby! Oh happy day!!!!!! Such lovely sweet cards Gayatri, love the colours and the background of the second one is awesome! Thanks for showing us these gorgeous cards with products from the new SSS release. Hi ADORABLE cards, they both are very cute and pretty, love the colors you used, I am really in love with the second card, love all the items in the background and in all those amazing colors, awesome post today, thanks. Beautiful stork….. Love the vertical stripes that are diagonal to catch the eye of the stork! I liked the bold color piece on the stork card. Pretty, pretty cards! Love the colors. Your colors just pop on that first card, so awesome! Such cute baby cards! My favorite is the first one, I love the bright colors! Your cards are delightful. Thank you. Beautiful baby card designs. I really love the bright colors on your stork card. Great cards! Do you record video? Wonderful cards! Especially love the first one with the bird on the pink background and all the other added pretty colors ! Thanks for sharing. Love baby cards! Thanks for sharing! Such pretty cards–thanks for sharing! I love the stork card–very pretty. Adorable cards. Loved the colors you used for the stork card. The stripped border paper was a great addition. Thanks for sharing. Love both baby cards. Love the pink glittered “oh baby”. So sweet. Thanks for the inspiration!!! 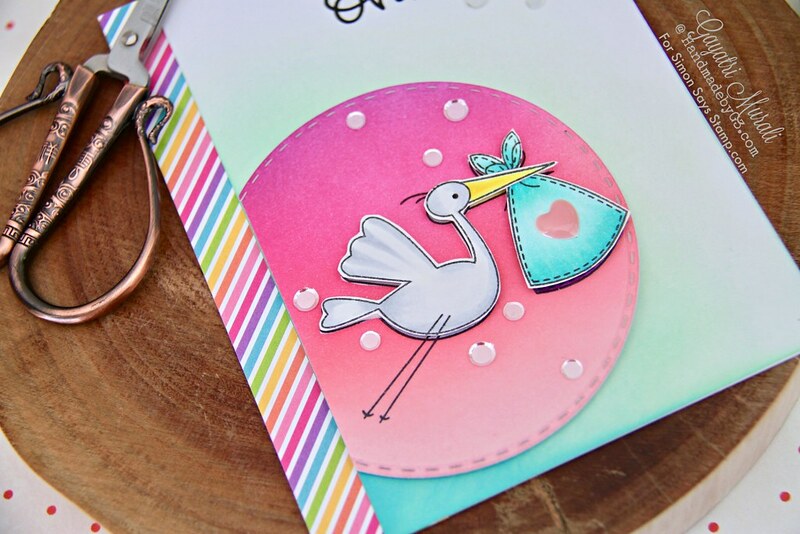 Your cards are so awesome….the ombre circle behind the stork is such a great idea! Great coloring, I love your work. I love all of your wonderful ideas! Both of your cards are great, love them. Such great ideas. Thanks for sharing. Oh my !! You’ve made such a sweet duo of cards !! Really like the pink background you inked for the stork. I think cutting him out and applying him worked perfectly, copic markers NEXT time 🙂 when your day is more cooperative. Totally understand THAT! Love your cards, glad you shared your talents! Such cute cards Gayatri!! I love the background on the stork card. I’ve had those days as well – when whatever I seem to do, everything goes wrong!! I love your card. These look great! I love the background that you made with the smaller stamps. The layout of the first card looks fantastic with that bright coloring and striped paper. I just love the card with the smaller stamps making the background! You did an awesome job! Wonderful cards, love the way you used these new stamps, adorable!!! Your baby cards couldn’t be cuter! I love the lay out of your first card and the colors are really pretty. The second card is so adorable using all the different baby stamps! Thank you for sharing your creativity with us! Great job! I love the background on the second card and great colours! Ink blending is amazing! I wish I could do it! Will work hard on that! Amazing cards love. Darling cards, even though you showed great restraint with the pastel colors. I love the use of a circle behind the stork and then a border so that the circle appears to be emerging from behind it. Very cute design! Love the bright colors on that first baby card! Love the Oh, Baby script. Love all these! So adorable! so stinkin’ cute; thanx for the inspiration! I adore your cards, there are super sweet!